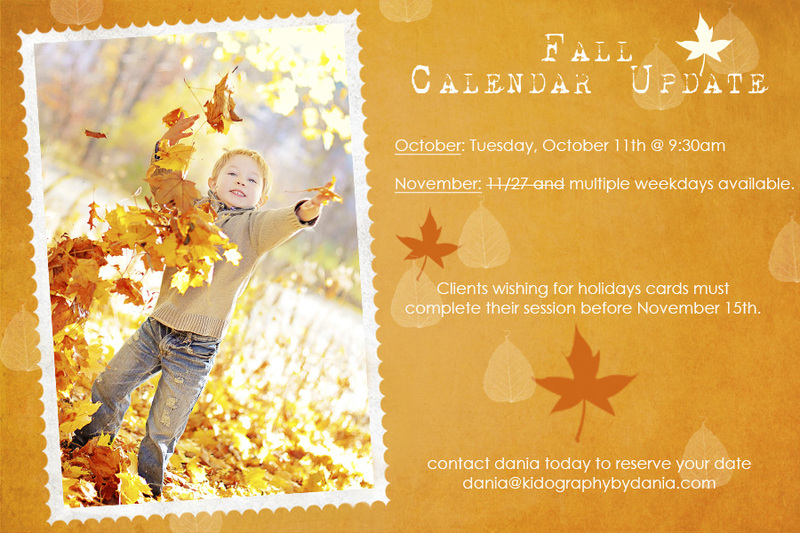 Calendar Update: Updated - Kidography by Dania, Photographing the tiny humans, and those who love them. Kidography by Dania, Photographing the tiny humans, and those who love them. Kidography is owned by Dania Bagyi and offers full service boutique photography in New York's Capital Region, including Albany, Saratoga, Delmar, Guilderland - capturing fun natural and candid moments with your family. First off, I cannot believe it’s already October! Where in the world did 2011 go?! Secondly, I cannot believe that my calendar is nearly booked through November (weekends now completely booked)…so if you’ve been thinking you want a fall/holiday session, do not wait to contact me! So, I’ve never been much for mini-sessions. I’ve tried in the past and have found that “mini” always turned into “not-so-mini”…I just can’t keep it to those short 20-30 minutes no matter how hard I try…your kiddos are just too stinkin’ cute! But given the holidays creeping up on us (eek!) and my limited availability for full sessions, I’m willing to try the mini’s again if there is sufficient interest. I’m thinking something along the lines of a 15-20 minute sessions (for realzies this time)…3 edited full resolution files sent to you in a zip file…$150. This way, those of you who want a professional picture for holiday gifts and cards, but maybe don’t need a full session, could get what you want. I would need to have 10 or so people sign up before I could commit to doing it at this special discounted price. If you or anyone you know may be interested, email me!